Anti-knife campaigners say "It sends out the message that knives are to be played with, that knives are a toy"
Leftover pumpkins have been put to good use this week in Warwickshire by being turned into clean energy. Severn Trent Water asked their staff to bring in their old Halloween pumpkins so they could be fed to an anaerobic digestion plant. The plant is located in Coleshill and produces 2.4MW of energy a year – the equivalent of powering 4,000 homes for 12 months. With one 600g pumpkin creating enough energy to power a lightbulb for 24 hours! “Pumpkins, like all food waste, are packed with energy which with a bit of ingenuity can be unlocked and turned into power. “The process works in a similar way to us eating food. Trucks full of food waste are emptied in to the machine which removes packaging and then chews it up and digests it, much like a human body. Read more: Your Halloween Pictures: How are you celebrating? Your Halloween Pictures: How are you celebrating? Many of you have been celebrating halloween today and sending in your creative pictures! Read more: Is this the best haunted house in the Midlands? Keep sending them in via email centralnews@itv.com or on our Facebook page. A couple have made it a Halloween to remember as they tied the knot this weekend with a wedding inspired by all things spooky. Police have issued guidelines for trick or treaters as well as vulnerable residents about how to approach Halloween and 'trick or treating'. Two devoted horror film fans made the most of Halloween and got married in a spooky ceremony in Coventry. It was a busy Halloween night for ambulance crews in the West Midlands as they saw a 25% rise in the number of calls from last weekend. 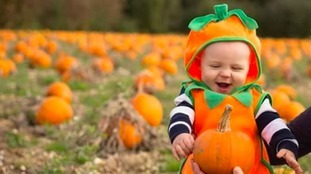 With Halloween just round the corner, you've been sending us your pumpkin photos. Here are some of the best ones.